It’s Your Island! Toberua Island Resort is a unique and privately owned island with fifteen recently refurbished traditional bures offering you an unforgettable Fijian holiday experience. Located in the Lomaiviti Group off the eastern side of Fiji’s main island Viti Levu, Toberua Island Resort is four sandy acres of lush tropical gardens awaiting your arrival. 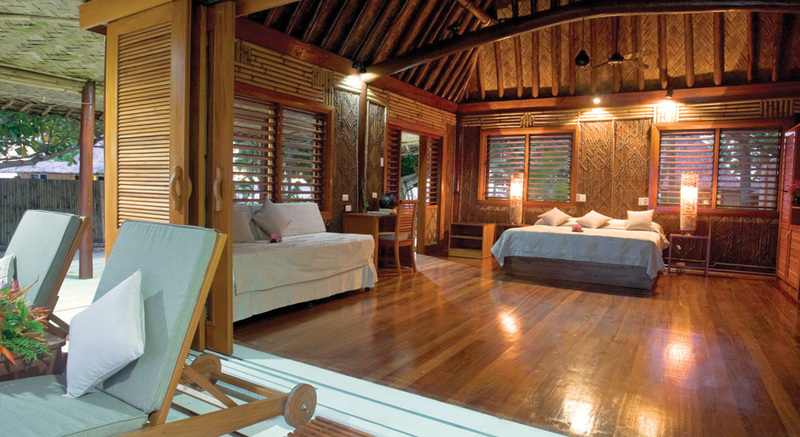 Your Premium, Deluxe or Tropical Oceanfront bure boasts an exceptional balance of pacific and contemporary style. This teamed with the special ambiance of Toberua is your place, your fun, your sun, your island. You can choose to participate in a wide range of activities or just relax and soak up the sun and tranquil atmosphere. Enjoy the crystal clear tropical waters, fine dining, pamper yourself at the spa or dance barefoot under the stars to the gentle sounds of live Fijian music – you decide. You will never be short of things to do at Toberua Island Resort. With a low tide golf course, path putting, spa, fishing, sailing, superb snorkeling and scuba diving, or lazing under a palm tree by the pool. You can be as energetic or as relaxed as you like — you choose. Toberua Island Resort offers a unique setting to celebrate your special occasion, to relax with family and friends or for your intimate romantic getaway. This is your island. The two Tropical Bures are positioned between the Premium and Entertainment Bures. They are designed to combine traditional architecture with contemporary style. Very similar in design to the Premium Bures the eleven Deluxe Bures are all nestled on the waters edge just steps between you and the ocean. Toberua embodies an unforgettable island experience providing fine dining, bar, gift shop, recently refurbished oceanfront bures, where you can relax and enjoy the stress free lifestyle. You will make many friends and take home happy memories. Gourmet meals are served in the restaurant or outdoors overlooking the beach under the shade of a palm tree or an umbrella. The ever changing menu offers a variety of locally grown fruits, vegetables, fish, seafood, New Zealand beef and lamb, freshly baked breads, cookies and delicious desserts. With prior notice the chef is happy to cater for special dietary requirements. Breakfast includes a buffet of fresh tropical fruits, freshly baked muffins, cereals, fruit juices, tea and coffee along with a daily changing hot breakfast. Meal Plan’s are Available. Flavors’ barbeque buffet is held weekly, usually on a Saturday night. The wine cellar boasts many fine New Zealand, Australian and French wines while the bar has a good selection of local and imported beers, spirits and cocktails besides non alcoholic beverages. Specialty coffees are also available. The island gift shop stocks Fijian souvenirs, clothing, snacks and toiletries. Dream of a perfect place to begin your lives together. Peaceful, quiet, romantic, candle lit dinners and privacy – Toberua sets the scene for a long and happy life together. Celebrate your love with an intimate ceremony on the beach, by the pool, among the gardens or at the open Bure. A memorable day for just the two of you or with family and friends the entire island can be yours to enjoy. The wedding coordinator can cater for your specific needs ensuring your special day is unforgettable. When you are on vacation you want to relax, but there’s more to rejuvenating than sitting on the beach. Your senses need an adventure too. • Snorkeling is accessible from the beach and a trip is organized to a near by reef most days. Masks, flippers and snorkels are all available from the marina. • A hobbie cat and windsurfer are available for your use. • Hand line fishing ~ Tackle and lines are available at the marina. • You’ll find the kayaks, paddles and buoyancy vests at the beach. • Journeys on the glass bottom boat provide a spectacular view of the coral and colorful fish. • Enjoy a plunge in the salt water pool or simply relax on a lounger under the shade of a palm tree. • The Toberua golf course was founded in 1985 by celebrated Australian artist Ken Done. The nine hole par three is playable only at low tide. Clubs are provided. • A nine hole mini path putting course follows the foot paths of the island. Putters are provided. • Volley ball ~ Fiji versus the world. Join the champion volleyball team for an energetic afternoon match. • Pool table, table tennis, and petanque are all available for your enjoyment. • Beside the bar is the library where the custom is “take one – leave one”. Board games are available at the office. • Join the weaving demonstration and learn more about this ancient Fijian tradition. • Coconut demonstration ~ learn the wonders and myths of this local fruit. • Take a guided trip under the surrounding waters of Toberua and be amazed by the sights that unfold. Trips are led by an experienced guide. A charge applies. A family friendly babysitting service is provided, and a charge applies. Toberua does not have a kids club however games and activities are organized for children.